It is popularly believed that fish have a memory span of only 30 seconds. Canadian scientists, however, have demonstrated that this is far from true – in fact, fish can remember context and associations up to twelve days later. The researchers studied African Cichlids (Labidochromis caeruleus), a popular aquarium species. These fish demonstrate many complex behaviours, including aggression, causing the scientists to predict that they could be capable of advanced memory tasks. Each fish was trained to enter a particular zone of the aquarium to receive a food reward, with each training session lasting twenty minutes. After three training days, the fish were given a twelve day rest period. The fish were then reintroduced into their training arena and their movements recorded with motion-tracking software. It was found that the cichlids showed a distinct preference for the area associated with the food reward, suggesting that they recalled the previous training experiences. Furthermore, the fish were able to reverse this association after further training sessions where the food reward was associated with a different stimulus. For fish living in the wild, ability to associate locations with food could be vital for survival. "Fish that remember where food is located have an evolutionary advantage over those that do not" said lead scientist Dr Trevor Hamilton. "If they are able to remember that a certain area contains food without the threat of a predator, they will be able to go back to that area. Decreases in the availability of food would promote the survival of species that can remember the location of food sources". Wild cichlids have a varied diet which includes snails, small fish, insects and plants. It is thought that they learn to associate locations with their preferred source of food. The researchers are now investigating whether the strength of fish memories are affected by environmental conditions or pharmacological drugs. Trackplot shows that Cichlids spent more time in the upper zone of the tank, which they had been trained to associate with a food reward. Credit: Dr. Trevor Hamilton and Erica Ingraham. Dr Hamilton's interest in African Cichlids was first inspired by reports from aquarium owners, including his colleague Erica Ingraham, a student at MacEwan University. "There are many anecdotes about how smart these fish are" he said. 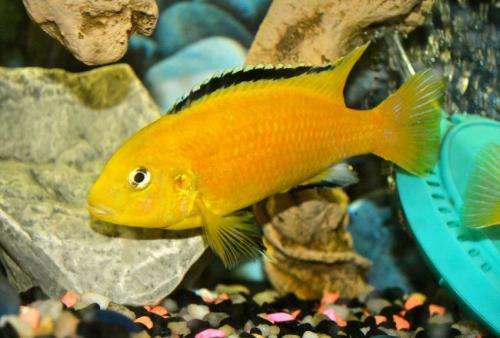 "Some people even believe that their cichlids watch television with them". This work is to be presented at the Society for Experimental Biology Annual Meeting 2014 in Manchester on Wednesday 2nd July.